Road crashes are the #1 cause of teen deaths in the U.S. and there is a good reason: new drivers are simply not getting enough driving time in the car with a Certified Professional Driving Instructor. Increase your peace of mind and lessen your parental driving requirements with 17 total hours of in-car training for your teen in our Advanced Driving Program. Start your teen down the road to safe driving. 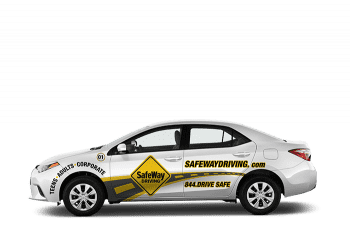 The SafeWay Advanced program fulfills 17 hours of the 37 hour State requirement while putting your young driver through half of SafeWay’s 20 different driving environments on 10 planned tracks that include both daytime and nighttime situations. We understand that every teen learns differently and some respond better to different teaching styles. Be prepared for a majority of roadside emergencies with this SafeWay branded kit. Including over 30 emergency care items for you and your car, this kit is exclusively provided to SafeWay Advanced Drivers. When you enroll in the SafeWay Advanced your teen will receive 17 SeatTime Hours leaving 20 additional State required hours to be completed by you. Learning to drive is not a rite of passage or achieved through a game or cool app. Only hours of training with a professional driving instructor will make your teen a safe driver. Start your teen’s advanced training with the SafeWay Advanced driving package.